Indexes and scales are important and useful tools in social science research. They have both similarities and differences among them. An index is a way of compiling one score from a variety of questions or statements that represents a belief, feeling, or attitude. Scales, on the other hand, measure levels of intensity at the variable level, like how much a person agrees or disagrees with a particular statement. If you are conducting a social science research project, chances are good that you will encounter indexes and scales. If you are creating your own survey or using secondary data from another researcher’s survey, indexes and scales are almost guaranteed to be included in the data. Indexes are very useful in quantitative social science research because they provide a researcher a way to create a composite measure that summarizes responses for multiple rank-ordered related questions or statements. In doing so, this composite measure gives the researcher data about a research participant's view on a certain belief, attitude, or experience. "When I think about myself and my job, I feel downhearted and blue." "When I’m at work, I often get tired for no reason." "When I’m at work, I often find myself restless and can’t keep still." "When at work, I am more irritable than usual." To create an index of job-related depression, the researcher would simply add up the number of "yes" responses for the four questions above. For example, if a respondent answered "yes" to three of the four questions, his or her index score would be 3, meaning that job-related depression is high. If a respondent answered “no” to all four questions, his or her job-related depression score would be 0, indicating that he or she is not depressed in relation to work. A scale is a type of composite measure that is composed of several items that have a logical or empirical structure among them. In other words, scales take advantage of differences in intensity among the indicators of a variable. 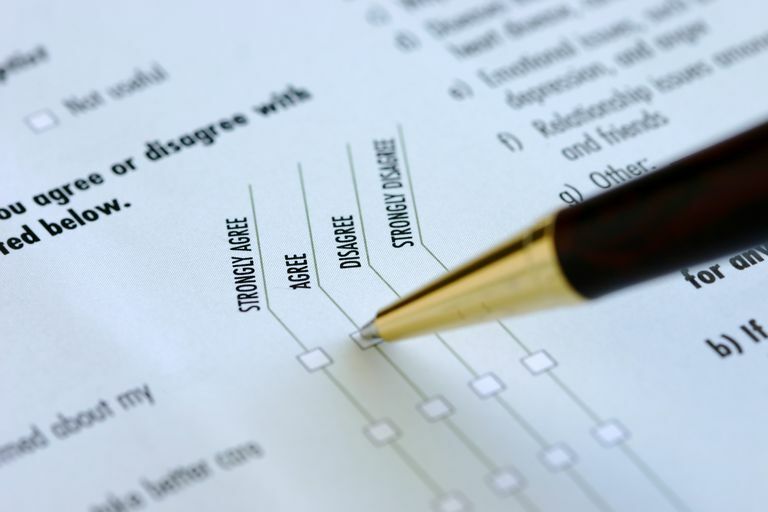 The most commonly used scale is the Likert scale, which contains response categories such as "strongly agree," "agree," "disagree," and "strongly disagree." Other scales used in social science research include the Thurstone scale, Guttman scale, Bogardus social distance scale, and the semantic differential scale. For example, a researcher interested in measuring prejudice against women could use a Likert scale to do so. The researcher would first create a series of statements reflecting prejudiced ideas, each with the response categories of "strongly agree," "agree," "neither agree nor disagree," "disagree," and "strongly disagree." One of the items might be "women shouldn’t be allowed to vote," while another might be "women can’t drive as well as men." We would then assign each of the response categories a score of 0 to 4 (0 for "strongly disagree," 1 for "disagree," 2 for "neither agree or disagree," etc.). The scores for each of the statements would then be added for each respondent to create an overall score of prejudice. If a respondent answered "strongly agree" to five statements expressing prejudiced ideas, his or her overall prejudice score would be 20, indicating a very high degree of prejudice against women. Scales and indexes have several similarities. First, they are both ordinal measures of variables. That is, they both rank-order the units of analysis in terms of specific variables. For example, a person’s score on either a scale or index of religiosity gives an indication of his or her religiosity relative to other people. Both scales and indexes are composite measures of variables, meaning that the measurements are based on more than one data item. For instance, a person’s IQ score is determined by his or her responses to many test questions, not simply one question. Even though scales and indexes are similar in many ways, they also have several differences. First, they are constructed differently. An index is constructed simply by accumulating the scores assigned to individual items. For example, we might measure religiosity by adding up the number of religious events the respondent engages in during an average month. A scale, on the other hand, is constructed by assigning scores to patterns of responses with the idea that some items suggest a weak degree of the variable while other items reflect stronger degrees of the variable. For example, if we are constructing a scale of political activism, we might score "running for office" higher than simply "voting in the last election." "Contributing money to a political campaign" and "working on a political campaign" would likely score in between. We would then add up the scores for each individual based on how many items they participated in and then assign them an overall score for the scale.